To kill with one touch. To harvest dead souls from the battlefields. Kate made Pegasus real. Now: a Norse goddess of death. Kate O’Hearn’s Pegasus series brought alive the flying horse of Greek myth. Such grace, drama and power. And now she’s back. With a breathtaking Viking myth, and a heroine to die for. 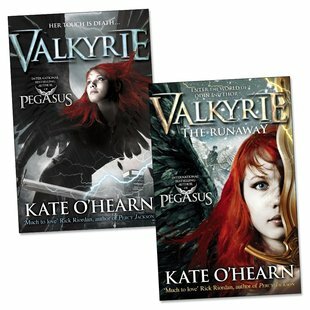 Freya is a Valkyrie – a winged goddess of darkness, a reaper of souls killed in war. Yet Freya doesn’t want to live a legend. She wants to know what it’s like to be human: to make friends, to laugh with boys. To be free of the curse of bringing death with one touch. Then a dead soldier’s soul sends her to the human world on an epic quest… Terrible enemies. Deadly risks. Heaven and hell to play for. It’s time for a brand new Valkyrie legend.